For other uses, see Christopher Street (disambiguation). Christopher Street is a street in the West Village neighborhood of the New York City borough of Manhattan. It is the continuation of 9th Street west of Sixth Avenue. It is most notable for the Stonewall Inn, which was located on Christopher Street. As a result of the Stonewall riots in 1969, the street became the center of New York State's gay rights movement in the late 1970s. To this day, the inn and the street serve as an international symbol of gay pride. Christopher Street is named after Charles Christopher Amos, the owner of the inherited estate which included the location of the street. Amos is also the namesake of nearby Charles Street, and of the former Amos Street, which is now West 10th Street. The road ran past the churchyard wall of the Church of St. Luke in the Fields (built 1820–22; rebuilt after a fire, 1981–85) still standing on its left, down to the ferry landing, commemorated in the block-long Weehawken Street (laid out in 1829), the shortest street in the West Village. At the Hudson River, with its foundation in the river and extending north to 10th Street, Newgate Prison, the first New York State Prison, occupied the site from 1796 to 1829, when the institution was removed to Sing Sing and the City plotted and sold the land. In 1961, Jane Jacobs, resident in the area and author of The Death and Life of Great American Cities published that same year, headed a group that successfully stopped Mayor Robert Wagner's plan to demolish twelve blocks along West Street north of Christopher Street, including the north side of Christopher Street to Hudson Street, and an additional two blocks south of it, slated for "urban renewal". 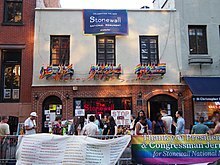 The Stonewall Inn on Christopher Street in Greenwich Village, a designated U.S. National Historic Landmark and National Monument, as the site of the June 1969 Stonewall riots and the cradle of the modern gay rights movement. In the 1970s, Christopher Street became the "Main Street" of gay New York. Large numbers of gay men would stroll its length at seemingly all hours. Gay bars and stores selling leather fetish clothing and artistic decorative items flourished at that time. This changed dramatically with the loss of many gay men during the AIDS epidemic in the 1980s. The apparent center of gay life subsequently shifted north of 14th Street to Chelsea. Christopher Street is the site of the Stonewall Inn, the bar whose patrons fought back against a police raid, starting the 1969 Stonewall riots that are widely seen as the birth of the gay liberation movement. The Christopher Street Liberation Day Committee formed to commemorate the first anniversary of that event, the beginning of the international tradition of a late-June event to celebrate gay pride. The annual gay pride festivals in Berlin, Cologne, and other German cities are known as Christopher Street Days or "CSD". Christopher Street magazine, a respected gay magazine, began publication in July 1976 and folded in December 1995. Anaïs Nin once worked at Lawrence R. Maxwell Books, located at 45 Christopher Street. Christopher Street is the site of the Stonewall Inn, the bar whose patrons started the 1969 Stonewall riots that are widely seen as the birth of the gay liberation movement. Near Sixth Avenue, Christopher Street intersects with a short, winding street, coincidentally named Gay Street. Since 1992, Christopher Park, located at the intersection of Christopher, Grove, and West 4th Streets, has hosted a duplicate of the sculpture Gay Liberation Monument by George Segal to commemorate the gay rights traditions of the area. The Oscar Wilde Bookshop, located on the corner of Christopher and Gay, was the oldest LGBT bookshop in the world until it closed in 2009. McNulty's Tea and Coffee Company, a purveyor dating back to 1895, is on the street. Kettle of Fish, a bar now on Christopher Street, was once located above the famous Gaslight Cafe on MacDougal Street. Since the Beat Generation, it has also become affiliated with Green Bay Packers fans. Adjacent to Sheridan Square is Christopher Park, a .145 acre landmark. The park that contains a bronze statue of Philip Sheridan and a reproduction of George Segal's Gay Liberation, originally located at Stanford University. St John's Lutheran Church is at 81 Christopher Street, between Bleecker and West 4th Streets. The Lucille Lortel Theatre, an Off-Broadway playhouse, is located at 121 Christopher Street. At the westernmost tip is the Christopher Street Pier, which was recently renovated and converted into a waterfront park. Christopher Street is the first stop in Manhattan on the 33rd Street branches of the PATH. The PATH identifies Christopher Street station with a large single capital 'C'. The street also hosts a station on the New York City Subway's IRT Broadway–Seventh Avenue Line at Christopher Street – Sheridan Square (1 and ​2 trains), Formerly, the Christopher Street elevated station served the now-demolished IRT Ninth Avenue Line. At the southwest corner of Seventh Avenue and Christopher Street is the Hess triangle, a mosaic which reads "Property of the Hess Estate Which Has Never Been Dedicated for Public Purpose". A surveying error for the subway line left this small triangle remained in private possession. Luigi Lucioni, Italian-American painter known for his still lifes, landscapes, and portraits. His family emigrated to Christopher Street from Malnate, Italy in 1911. "Christopher Street" is both a song and the main location of the 1953 musical Wonderful Town. The courtyard of 125 Christopher Street was the model for the sets of the 1954 thriller film Rear Window, directed by Alfred Hitchcock. In Paul Simon's 1983 song "Rene and Georgette Magritte with Their Dog after the War," artist René Magritte and his wife Georgette "were strolling down Christopher Street when they stopped in a men's store." The 1999 song "My My Metrocard", by queercore punk band Le Tigre on their debut album, mentions the location. NYPD Blue TV Show, Season 7, Episode 3 (Released in the year 2000) “The Man with Two Right Shoes” shows Christopher Street directly after detectives mention “hitting the fairy bars” to find a gay, male prostitute. ^ Block, Lawrence. "Greenwich Village: Glorying in its differentness; For 300 Years, A World Apart" The New York Times (November 20, 1988). Accessed: October 7, 2007. ^ Weehawken, New Jersey, lies on the opposite shore. ^ Frank Bergen Kelley, Edward Hagaman Hall. Historical Guide to the City of New York (City History Club of New York), 1909:75. ^ a b Julia Goicichea (August 16, 2017). "Why New York City Is a Major Destination for LGBT Travelers". The Culture Trip. Retrieved February 2, 2019. ^ a b Stryker, Susan. "Christopher Street Gay Liberation Day: 1970". PlanetOut. Archived from the original on 31 March 2008. Retrieved 28 June 2010. ^ Recollections of Anaïs Nin, Ohio University Press, 1996, p. 6. ^ Google (May 15, 2015). "Gay Street, New York, NY 10014" (Map). Google Maps. Google. Retrieved May 15, 2015. ^ "Christopher Park: Gay Liberation". New York City Department of Parks & Recreation. Retrieved August 31, 2013. ^ "Oscar Wilde Bookshop". New York. Retrieved August 31, 2013. ^ McNulty's official site, accessed 23 July 2008. ^ Frommer's review of McNulty's Tea & Coffee Company, The New York Times. Accessed online 23 July 2008. ^ Sawyer-Lauðcanno, Christopher. "E.E. Cummings: A Biography", p. 135, Google Books. Accessed October 7, 2007. "On March 2 he moved out of the Brevoort Hotel, where he had been staying, and took up residence at 11 Christopher Street, in the West Village." ^ Embury, Stuart P. (2006). "Chapter One: The Early Years". The Art and Life of Luigi Lucioni. Embury Publishing Company. pp. 1–3. ^ "Dawn Powell, Novelist, Is Dead; Author of Witty, Satirical Books; Middle Class Was the Object of Her Stinging Fiction-13 Books Published", The New York Times, November 16, 1965. "Miss Powell, who had resided in Greenwich Village most of her life, maintained an apartment at 95 Christopher Street, where she did most of her writing in recent years." ^ Lumenick, Lou (7 August 2014). "Inside the real Greenwich Village apartment that inspired Rear Window". New York Post. Retrieved 21 November 2016. ^ "My My Metrocard" lyrics. Wikimedia Commons has media related to Christopher Street (Manhattan).